← Have Fun. Don’t Die. I wanted terribly fatty thick rich soup. Bacon Beer Cheese soup. But if I cooked that I’d have to atone with ten zillion salads or something, which would really nullify the coziness of the soup. So I added a ton of broccoli and wild rice. All better right? ~3/4lb bacon chopped up and tossed to fry in the Dutch Oven. If I had been thinking more clearly slab bacon would have been better. 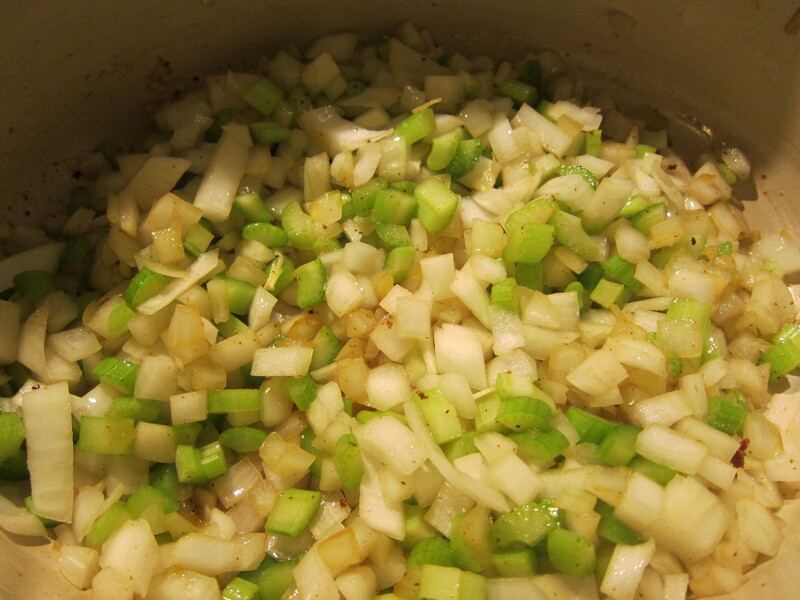 – 1 onion, 3 stalks celery, 4ish cloves garlic, chopped fine and tossed to sweat in the oil. – bunch of black pepper and good dash of salt. ~3T of flour (to make a rue) stirred in the oil and stuff. Let cook until slightly toasty but not brown. 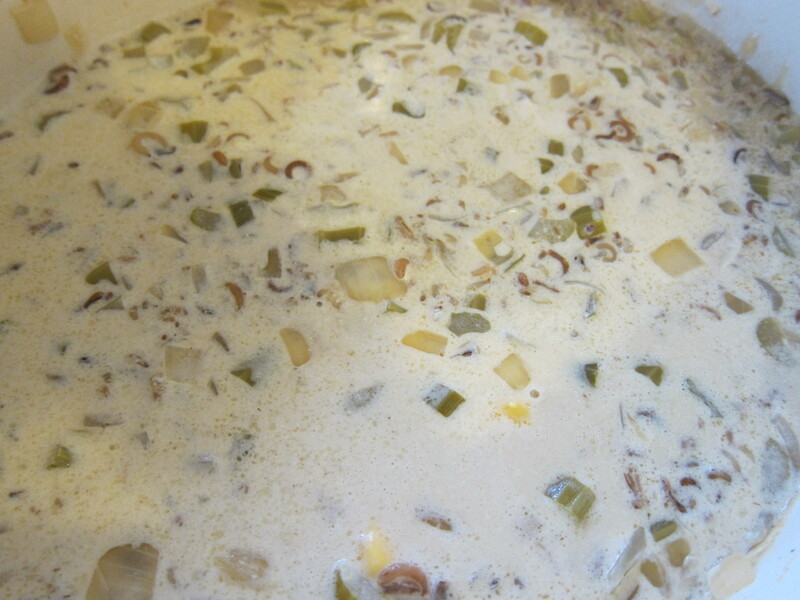 – 1 bottle of IPA beer, some mustard, some chicken broth (water and bouillon) Just enough liquid for the wild rice. – 1 cup (well, just over, but whatever) of wild rice. Got bubbly on the stove and then stuck in the oven. – let simmer away in the oven for like 20-30min. Until rice is just tender. – Put back on the stove on low. – Add 1 pint of cream (or milk or whatever) and lots of cheese. I used a mix of 1/2 lb shredded extra sharp cheddar and Velveeta (terrible I know, but whatever it melts like a dream). 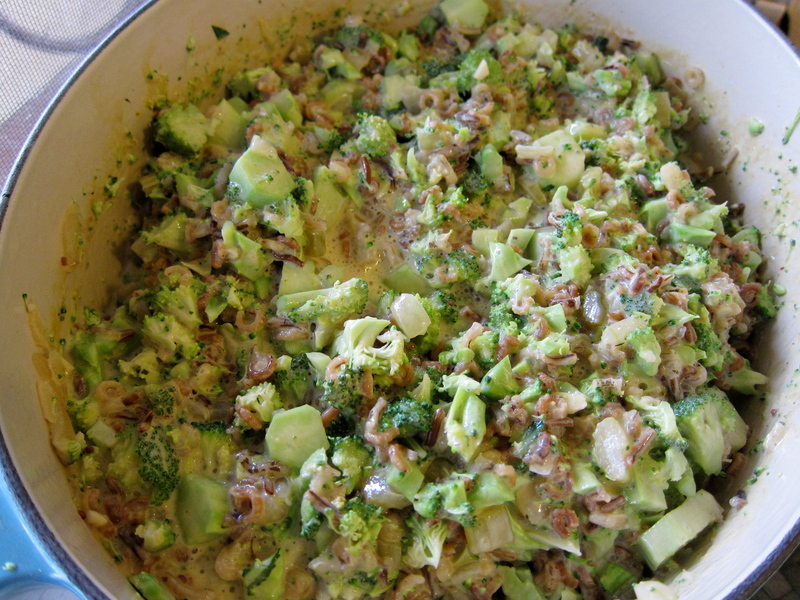 – 3 bunches of broccoli chopped tiny and added as I went. Tiny green bits everywhere! Back in the oven for about another hour or so to get the broccoli all soft and tender and bring it back to a soupy consistency. – Stirred the bacon into the soup. Turns out I think I overdid the healthy part. It was yummy but not decadent. Next time, more bacon! More beer! More cheese and cream! It was also better the next day with a good squeeze of Sriracha and a dash of Tobasco. I think the bit of heat and touch of vinegar made it significantly better. 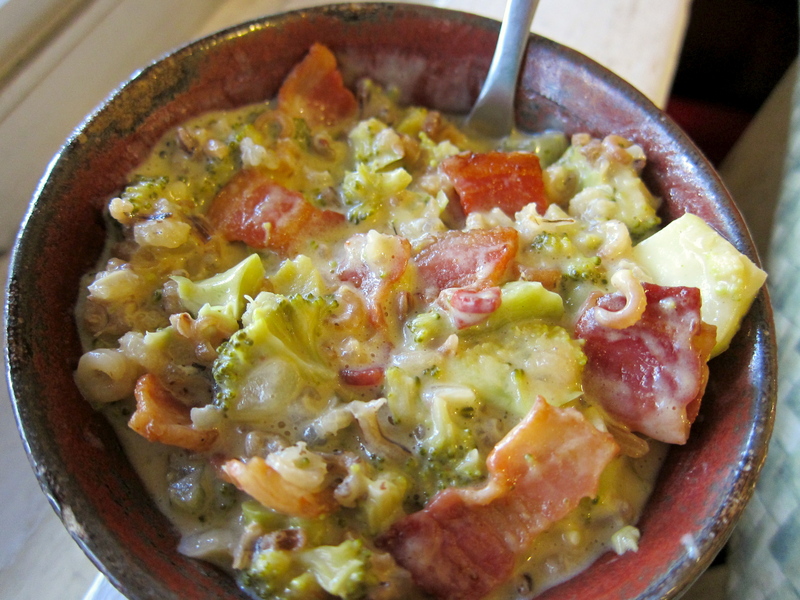 This entry was posted in Kym Cooked and tagged bacon, Bacon Beer Cheese soup, beer cheese soup, broccoli, cheese, comfort food, healthy food, soup, wild rice. Bookmark the permalink.